Horses accepted into our program need to be smart, patient, gentle and love to work with our students and volunteers. We are pleased to introduce our wonderful equine therapists. A registered Quarter Horse, Ivan had a long career in the show jumping ring. When Ivan came to FTGU, he had a strong need for attention (positive OR negative) that earned him the nicknames of “Dennis the Menace” and “Bart Simpson” (depending on your generation). 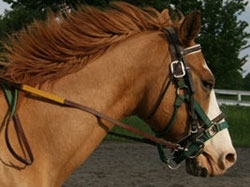 He learned the tools of his trade well and is now a very dependable mount and great teacher for a variety of riders. 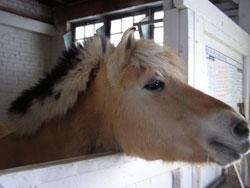 Not only is our Tina Turner a registered Fjord, she is a Famous Fjord. In 1988, a Norwegian Fjord breeder flew 40 Fjords to the US to expand the breeding stock here. This operation was called the “Big Lift” and our Tina was one of the mares chosen to be part of the expansion. 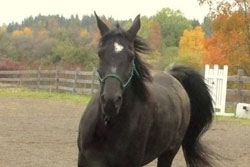 A hard-working, sturdy, no nonsense yet sweet, gentle mare, Tina is the horse every therapeutic program wants. Her smaller size but impressive strength, patience, disposition and versatility (not to mention being a very easy keeper!) make her the go-to horse for Therapeutic Riding, Groundwork, Hippotherapy and Equine Assisted Psychotherapy/Learning. An Appendix Quarter Horse, Sierra may be the most intuitive and best communicator in the FTGU herd. Her over tracking stride gives her riders ample input and her need for personal space adeptly teaches boundaries and attentiveness. Early on she learned what “walk on”, “trot”, “easy” and “whoa” mean, like most horses do. When the instructor would ask the rider to cue the horse physically, Sierra, having heard the word, would comply before the rider had a chance to ask. So we started spelling. When she learned how to spell those words, we wondered if we should learn a new language. However, she would no doubt learn the new language fluently long before we do! 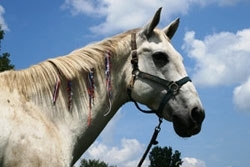 A registered Paint & most senior FTGU gelding, Lucky is the darling of most of the students, volunteers & staff at FTGU. His incredibly smooth gaits, strong work ethic & quiet demeanor make him a delight to ride & to work with. He does have an “impish” streak so don’t ever stand near him when he has water in his mouth. 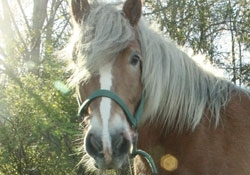 Our beloved Haflinger, Mike came to us through the generosity of Oprah Winfrey (truly!). In 2008, Oprah instituted a fundraising program called “Oprah’s Big Give” through the ABC television network affiliates. Our local Channel 9 took part in the program. The requirement was to write an essay about why your non-profit should be given funds from Oprah’s Big Give. We wrote about our program and our new “Horses for Heroes” program for Veterans. We wrote that we needed a very sturdy horse who could carry more weight than our other horses. We also needed a saddle for this sturdy horse. Amazingly, we were chosen as one of the grantees! Through the generosity of our friend, Deb Staley of Edgecort Farm, we were able to purchase Mike AND a saddle for him! A little on the nervous side when he first came to FTGU, Mike has matured and learned much about patience, trust and carrying a rider. He will now fill in for some of the older horses who need a lighter workload. 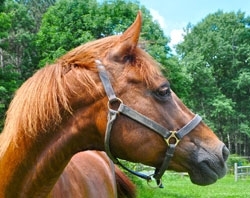 The result of her breeding, Ginger has the beauty and endurance of the Arabian and the strength of the Quarter Horse. Ginger spent many years competing in Three Day Eventing (Dressage, Show Jumping and Cross Country) and also teaching eventing to her riders after her competitive career came to a close. The best way to describe Ginger is sassy and very, very smart. She was very well trained for her discipline and remembers her training very well. Lately, she has shown very strong ability as an Equine Assisted Psychotherapy and Learning facilitator due to her keen awareness and attention to humans. Utica is a 21-year-old Pure Standardbred trotter, who had a racing career and then worked with the Amish pulling buggies. He was unemployed for awhile before coming to From the Ground Up, where he is a very calm boy, good with people, and easy to work with. 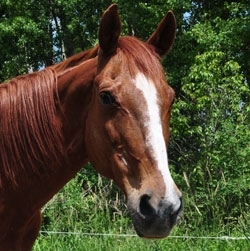 Armani is a 12-year-old purebred Arabian who was previously a competitive endurance horse. 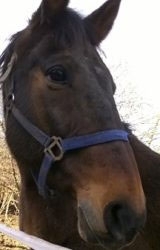 He is very smart, has had natural horsemanship training, and loves people.